Director of Admissions, Lutheran School of Theology at Chicago. I find profound joy in the privilege of being with people in the most holy times of their lives: baptism, marriage, sickness, and death. It is truly a blessing to be called to be with people, learning together to trust God, and God's great love in the joys and the sorrows of our lives. There are countless folks who have nurtured me along the way. I am grateful to God for the presence of my spouse, John; my friend and colleague, Pr. Elizabeth Nees (who God used to help me find the Lutheran church! ); Pr. Marsh Drege, my first mentor who showed me a way of just 'being' with people; and Pr. Andrea Walker, my other mentor who taught me everything else I needed to know about walking with God's people. A huge platter of BBQ Ribs on a family vacation in Montana! Matt was born and raised in Northern Colorado. 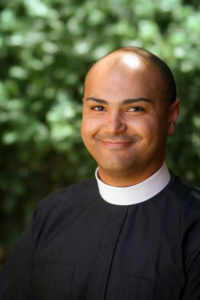 Following his undergraduate studies at the University of Northern Colorado, Matt moved to Washington, DC, where he served in the Lutheran Volunteer Corps. DC is also where Matt joined Luther Place and where his passion for his faith truly took off. While pursuing a Master's degree in Media Studies at The Pennsylvania State University, Matt began to discern a call to ordained ministry, and after receiving his Master's, he enrolled at the Lutheran Theological Seminary at Philadelphia (LTSP). It was in his second year of seminary studies that Matt met John Weit, who was beginning his seminary coursework to pursue church music as his full-time career. Matt and John were married in the LTSP Chapel in May 2010. I was a latecomer to Lutheranism. I did not join a Lutheran church until after college, and it was a couple of years after that that I began to sense God calling me toward the path to ordained ministry. But deep down, I realize that God had been nurturing these gifts in me for years before I ever even imagined of being a pastor! After starting down the path of several different career choices, it was wonderful to find a vocation that encompassed all my passions: social justice, education, and love of God.